Daniel Wroughton Craig is an English actor. His early roles include the films Elizabeth, The Power of One, A Kid in King Arthur's Court and television episodes of Sharpe's Eagle, Zorro, and The Young Indiana Jones Chronicles: Daredevils of the Desert. His breakthrough performances were in the films Lara Croft: Tomb Raider, Road to Perdition, Layer Cake, Munich, and The Golden Compass. Craig became well known internationally after he was cast as the sixth actor to portray fictional secret agent James Bond in the film series. He made his début as the character in the 2006 film, Casino Royale. He was critically acclaimed, and was nominated for a BAFTA award, for his portrayal in the film. He most recently starred in the films Defiance, Cowboys and Aliens, The Adventures of Tintin, and the English-language adaptation of The Girl with the Dragon Tattoo. Craig was born in Chester, Cheshire, England. His mother, Carol Olivia (née Williams), was an art teacher, and his father, Timothy John Wroughton Craig, was the landlord of the pubs "Ring o' Bells" and "The Boot Inn" , and also served as a midshipman in the Merchant Navy. Both of Craig's parents were of half-Welsh descent. He was brought up on the Wirral Peninsula, and attended a primary school in Frodsham and Hoylake called Holy Trinity Primary School. He attended Hilbre High School in later years. He began acting in school plays at age six. Craig moved to London when he was sixteen to join the National Youth Theatre after a stay at Calday. He and his older sister, Lea, attended Hilbre High School and Calday Grange Grammar School in West Kirby. He played for Hoylake Rugby Club. He attended the Guildhall School of Music and Drama at the Barbican and graduated in 1991 after three years of study under Colin McCormack. Craig appeared as Joe in the Royal National Theatre's production of Tony Kushner's Angels in America in November 1993. An early starring role was as 'Geordie' in the BBC's 1996 drama Our Friends in the North, with early film roles being as Angelina Jolie's rival and love interest in Lara Croft: Tomb Raider , before appearing in Sam Mendes's movie Road to Perdition , with Tom Hanks and Paul Newman. Other leading film roles include Sword of Honour , The Mother with Anne Reid, Sylvia with Gwyneth Paltrow, Layer Cake with Sienna Miller, Enduring Love with Rhys Ifans, Steven Spielberg's Munich with Eric Bana, Infamous and Casino Royale, The Golden Compass , Quantum of Solace, Defiance , and ''Cowboys & Aliens . 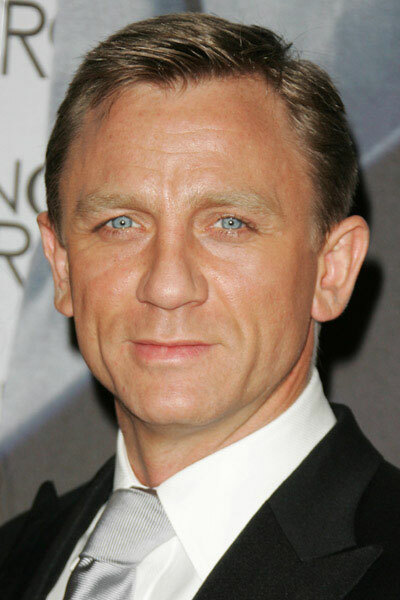 In 2005, Craig was contracted by EON Productions to portray James Bond. He stated that he "was aware of the challenges" of the James Bond franchise which he considers "a big machine" that "makes a lot of money". He aimed at bringing more "emotional depth" to the character. Being born in 1968, Craig is the first actor to portray James Bond to have been born after the Bond series already started, and Ian Fleming, the novels' writer, had died. Significant controversy followed the decision, as it was doubted if the producers had made the right choice. Throughout the entire production period Internet campaigns expressed their dissatisfaction and threatened to boycott the film in protest. Craig, unlike previous actors, was not considered by the protesters to fit the tall, dark, handsome image of Bond to which viewers had been accustomed. The Daily Mirror ran a front page news story critical of Craig, with the headline, "The Name's Bland – James Bland." Although the choice of Craig was controversial, numerous actors publicly voiced their support, most notably, four of the five actors who had previously portrayed Bond – Pierce Brosnan, Timothy Dalton, Sean Connery and Roger Moore – called his casting a good decision. Clive Owen, who had been linked to the role, also spoke in defence of Craig. The first film, Casino Royale, premièred on 14 November 2006 and grossed a total of US$594,239,066 worldwide, which makes the film the highest grossing Bond film to date. After the film was released, Craig's performance was highly acclaimed. As production of Casino Royale reached its conclusion, producers Michael G. Wilson and Barbara Broccoli announced that pre-production work had already begun on the 22nd Bond film. After several months of speculation as to the release date, Wilson and Broccoli officially announced on 20 July 2006 that the follow-up film, Quantum of Solace, was to be released on 7 November 2008 and that Craig plays Bond with an option for a third film. On 25 October 2007, MGM CEO Harry Sloan revealed at the Forbes Meet II Conference that Craig had signed on for four more Bond films, through to Bond 25. In 2006, Craig was invited to join the Academy of Motion Picture Arts and Sciences. On 12 June 2008, Craig sliced the top of one of his fingers off while filming Quantum of Solace. The accident was the latest in a string of incidents surrounding the shoot, including a fire at one of the sets in Pinewood Studios, UK; a car crash that left the stunt driver in a serious condition; and an Aston Martin skidding off the roads in heavy rains while being transported to the set in northern Italy and plunging into Lake Garda. Craig describes his portrayal of Bond as an anti-hero: “The question I keep asking myself while playing the role is, ‘Am I the good guy or just a bad guy who works for the good side?’ Bond’s role, after all, is that of an assassin when you come down to it. I have never played a role in which someone’s dark side shouldn’t be explored. I don’t think it should be confusing by the end of the movie, but during the movie you should be questioning who he is.” Craig also states that his favourite previous Bond actor was Sean Connery, but says, "I'd never copy somebody else. I would never do an impression of anybody else or try and improve on what they did. That would be a pointless exercise for me". His favourite Bond film is From Russia with Love. On a James Bond-centric episode of The South Bank Show, Connery divulged his thoughts on Craig's casting as Bond, whom he described as "fantastic, marvelous in the part." When he was told that Craig had taken particular note of his performances, Connery said that he was "flattered," and that Craig "really gets" the 'danger element' to Bond's character. On 19 April 2010, Craig's expected third Bond film was announced to have been suspended indefinitely due to the crippling debt and uncertain future of MGM. However, both Craig and Sam Mendes hoped to resume work on the film soon. The film has since resumed and Craig will return as Bond once again, with the film due for release on 9 November 2012. Skyfall is expected to be part of year-long celebrations of the 50th anniversary of Dr. No. On December 23 2010, it was announced that Daniel Craig has signed on for five future Bond films, which would break Roger Moore's record of the longest running actor to portray the character by one film. In 1999, Craig starred as Richard in a TV drama called Shockers: The Visitor. In 2007, he portrayed Lord Asriel in The Golden Compass, the film adaptation of Philip Pullman's novel. Eva Green, who played Bond girl Vesper Lynd in Casino Royale, also starred in the film, although she did not appear in any scenes with Craig. In a stage version of the book, Asriel had previously been played by Timothy Dalton, one of Craig's predecessors in the role of James Bond. In early 2001, Craig expressed an interest in being a part of the Star Trek franchise, professing his love of the series to the World Entertainment News Network and a desire to have a "stint in the TV show or a film. It's been a secret ambition of mine for years." On 16 March 2007, Craig made a cameo appearance as himself in a sketch with Catherine Tate who appeared in the guise of her character Elaine Figgis from The Catherine Tate Show. The sketch was made for the BBC Red Nose Day 2007 fundraising programme. In 2008's Defiance, he played Tuvia Bielski, a Jewish resistance fighter in the woods of Belarus during World War II who saved 1,200 people. The shot in Casino Royale of Craig sporting swimming trunks has often topped many sexiest male celebrity polls, and in 2009 Del Monte Foods launched an ice pop moulded to resemble Craig emerging from the sea. Craig co-starred with Hugh Jackman, in a limited engagement of the play A Steady Rain, on Broadway at the Schoenfeld Theatre, which opened in previews on 10 September 2009 and closed on 6 December 2009. Craig lent his voice and likeness as James Bond for both the Wii game GoldenEye 007, an enhanced remake of the 1997 game for the Nintendo 64, and Blood Stone, an original game for Xbox 360, PlayStation 3, Nintendo DS, and Microsoft Windows. In August 2010, Craig was cast as crusading journalist Mikael Blomkvist in David Fincher's 2011 adaptation of Stieg Larsson's novel The Girl with the Dragon Tattoo. Craig co-starred with Harrison Ford and Olivia Wilde in Cowboys & Aliens, an American science fiction Western film, based on Scott Mitchell Rosenberg's 2006 graphic novel of the same name. In 1992, Craig married Scottish actress Fiona Loudon, with whom he has a daughter, Ella. The marriage ended in divorce in 1994. Craig and actress Rachel Weisz began dating in December 2010. Craig and Weisz married on 22 June 2011 in a private New York ceremony, with only four guests in attendance, including Craig's 18-year-old daughter Ella, and Weisz's four-year-old son Henry. Craig and Weisz had been friends for many years and had worked together on the movie Dream House shortly before they began dating in late 2010. In October 2008, Craig paid £4 million for an apartment near Regent's Park, London. He is a Liverpool F.C. supporter. Whole or part of the information contained in this card come from the Wikipedia article "Daniel Craig", licensed under CC-BY-SA full list of contributors here.